The Jackie Robinson Biopic "42" gets its official release tomorrow Friday April 12 2013. To mark the occasion we are going to take a look at one of the favorite cards in the non-Phils portion of the Phungo collection. If your a collector with enough money to purchase a hobby box, you may want to consider picking up a vintage Jackie Robinson card instead. If your not too picky about condition you can even have a vintage Jackie Robinson card. What crummy game used relic is going to top that? The above Jackie Robinson card which is a bit soft on the edges with a couple of creases but no marks went for $80 in January of 2010. Recent completed auctions for the card went as low as $26.50 (trimmed). Untrimmed cards in ok shape started at $54. A low end graded card ( PSA1 Poor) went for $62. 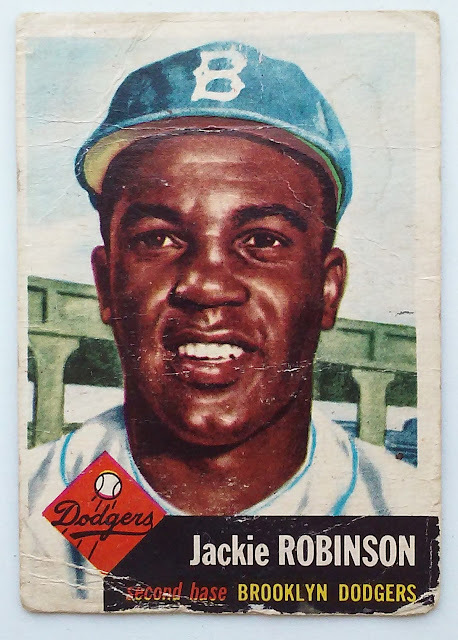 There were roughly 10 auctions of 53 Topps Jackie Robinsons that ended between $54 and $80 - all of which were cards in similar condition to mine. Great card. If I ever hit the lottery, I'd love to build a complete run of Robinson's Topps cards. For now, I'm happy with my 1956 issue.